Get ‘em while they’re hot!! 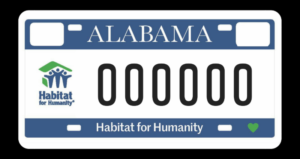 The Association of Alabama Habitat Affiliates (AAHA) has designed a specialty license plate for Habitat supporters statewide. The state requires 1000 people to commit to purchasing the plate before they will begin production. AAHA is willing to front the funds for the initial 1000 plates for the first year. Translation: you can get a Habitat plate for free! After the first year, there will be a fee for the plate, but a portion of those proceeds will support your local Habitat. These plates can be used on any vehicle, including motorcycles and trailers. If your business has a fleet of vehicles, consider the Habitat plate for all of them! This is just one more (easy) way that you can support our mission. To commit to your free Habitat plate, visit this link or call Lydia (256-340-9609, ext. 224) with your contact info and current license plate number. We think you’ll like sporting the Habitat logo on your vehicle, and we’ll be happy to see you advertising our great organization each and every day that you drive!